God gives us two gifts that fulfill the Law's righteous demands, but which the Law itself could never give us. 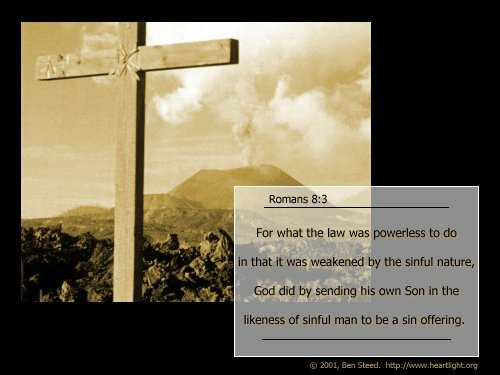 First, he gives us the perfect sin offering — his Son Jesus — to forgive, cleanse, and redeem us from our sin. Second, he gives us his Spirit to empower us to be what he wants us to be. God gives us in the New Covenant what the Law and the Prophets promised was coming. Praise God for his plan, his promises, and his gifts! Thank you, Heavenly Father, for your incomparable kindness and grace in giving me your great and perfect gifts of your precious and perfect Son and the blessed Holy Spirit. In Jesus' name, and by the intercession of the Holy Spirit, I praise and thank you dear Father. Amen.